Thomas Hobbes (/hɒbz/; 5 April 1588 – 4 December 1679), in some older texts Thomas Hobbes of Malmesbury, was an English philosopher who is considered one of the founders of modern political philosophy. Hobbes is best known for his 1651 book Leviathan, which established the social contracttheory that has served as the foundation for most later Western political philosophy. In addition to political philosophy, Hobbes also contributed to a diverse array of other fields, including history, jurisprudence, geometry, the physics of gases, theology, ethics, and general philosophy. Though on rational grounds a champion of absolutism for the sovereign, Hobbes also developed some of the fundamentals of European liberal thought: the right of the individual; the natural equality of all men; the artificial character of the political order (which led to the later distinction between civil society and the state); the view that all legitimate political power must be „representative” and based on the consent of the people; and a liberal interpretation of law that leaves people free to do whatever the law does not explicitly forbid. His understanding of humans as being matter and motion, obeying the same physical laws as other matter and motion, remains influential; and his account of human nature as self-interested cooperation, and of political communities as being based upon a „social contract” remains one of the major topics of political philosophy. Thomas Hobbes was born at Westport, now part of Malmesbury in Wiltshire, England, on 5 April 1588. Born prematurely when his mother heard of the coming invasion of the Spanish Armada, Hobbes later reported that „my mother gave birth to twins: myself and fear.” His childhood is almost completely unknown, and his mother’s name is unknown. His father, Thomas Sr., was the vicar of Charlton and Westport. Thomas Hobbes, the younger, had a brother Edmund, about two years older, and a sister. Thomas Sr. was involved in a fight with the local clergy outside his church, forcing him to leave London and abandon the family. The family was left in the care of Thomas Sr.’s older brother, Francis, a wealthy merchant with no family. Hobbes Jr. was educated at Westport church from age four, passed to the Malmesbury school, and then to a private school kept by a young man named Robert Latimer, a graduate of the University of Oxford. Hobbes was a good pupil, and around 1603 he went up to Magdalen Hall, the predecessor college to Hertford College, Oxford. The principal John Wilkinson was a Puritan, and he had some influence on Hobbes. At university, Hobbes appears to have followed his own curriculum; he was „little attracted by the scholastic learning”. He did not complete his B.A. degreeuntil 1608, but he was recommended by Sir James Hussey, his master at Magdalen, as tutor to William, the son of William Cavendish, Baron of Hardwick (and later Earl of Devonshire), and began a lifelong connection with that family. Hobbes became a companion to the younger William and they both took part in a grand tour of Europe in 1610. Hobbes was exposed to European scientific and critical methods during the tour, in contrast to the scholastic philosophy that he had learned in Oxford. His scholarly efforts at the time were aimed at a careful study of classic Greek and Latin authors, the outcome of which was, in 1628, his great translation of Thucydides‘ History of the Peloponnesian War, the first translation of that work into English from a Greek manuscript. It has been argued that three of the discourses in the 1620 publication known as Horea Subsecivae: Observations and Discourses also represent the work of Hobbes from this period. Although he associated with literary figures like Ben Jonson and briefly worked as Francis Bacon‘s amanuensis, he did not extend his efforts into philosophy until after 1629. His employer Cavendish, then the Earl of Devonshire, died of the plague in June 1628. The widowed countess dismissed Hobbes, but he soon found work, again as a tutor, this time to Gervase Clifton, the son of Sir Gervase Clifton, 1st Baronet. This task, chiefly spent in Paris, ended in 1631 when he again found work with the Cavendish family, tutoring William, the eldest son of his previous pupil. Over the next seven years, as well as tutoring, he expanded his own knowledge of philosophy, awakening in him curiosity over key philosophic debates. He visited Florence in 1636 and was later a regular debater in philosophic groups in Paris, held together by Marin Mersenne. Hobbes’s first area of study was an interest in the physical doctrine of motion and physical momentum. Despite his interest in this phenomenon, he disdained experimental work as in physics. He went on to conceive the system of thought to the elaboration of which he would devote his life. His scheme was first to work out, in a separate treatise, a systematic doctrine of body, showing how physical phenomena were universally explicable in terms of motion, at least as motion or mechanical action was then understood. He then singled out Man from the realm of Nature and plants. Then, in another treatise, he showed what specific bodily motions were involved in the production of the peculiar phenomena of sensation, knowledge, affections and passions whereby Man came into relation with Man. Finally he considered, in his crowning treatise, how Men were moved to enter into society, and argued how this must be regulated if Men were not to fall back into „brutishness and misery”. Thus he proposed to unite the separate phenomena of Body, Man, and the State. Hobbes came home, in 1637, to a country riven with discontent, which disrupted him from the orderly execution of his philosophic plan. However, by the end of the Short Parliament in 1640, he had written a short treatise called The Elements of Law, Natural and Politic. It was not published and only circulated as a manuscript among his acquaintances. A pirated version, however, was published about ten years later. Although it seems that much of The Elements of Law was composed before the sitting of the Short Parliament, there are polemical pieces of the work that clearly mark the influences of the rising political crisis. Nevertheless, many (though not all) elements of Hobbes’s political thought were unchanged between The Elements of Law and Leviathan, which demonstrates that the events of the English Civil War had little effect on his contractarian methodology. However, the arguments in Leviathan were modified from The Elements of Law when it came to the necessity of consent in creating political obligation. Namely, Hobbes wrote in The Elements of Law that Patrimonial kingdoms were not necessarily formed by the consent of the governed, while in Leviathanhe argued that they were. This was perhaps a reflection either of Hobbes’s thoughts about the engagement controversy or of his reaction to treatises published by Patriarchalists, such as Sir Robert Filmer, between 1640 and 1651. When in November 1640 the Long Parliament succeeded the Short, Hobbes felt that he was in disfavour due to the circulation of his treatise and fled to Paris. He did not return for 11 years. In Paris, he rejoined the coterie around Mersenne and wrote a critique of the Meditations on First Philosophy of Descartes, which was printed as third among the sets of „Objections” appended, with „Replies” from Descartes, in 1641. A different set of remarks on other works by Descartes succeeded only in ending all correspondence between the two. The English Civil War broke out in 1642, and when the royalist cause began to decline in mid-1644, the king’s supporters fled to Europe. Many came to Paris and were known to Hobbes. This revitalised Hobbes’s political interests and the De Cive was republished and more widely distributed. The printing began in 1646 by Samuel de Sorbiere through the Elsevier press at Amsterdam with a new preface and some new notes in reply to objections. 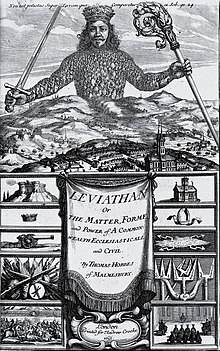 The company of the exiled royalists led Hobbes to produce Leviathan, which set forth his theory of civil government in relation to the political crisis resulting from the war. Hobbes compared the State to a monster (leviathan) composed of men, created under pressure of human needs and dissolved by civil strife due to human passions. The work closed with a general „Review and Conclusion”, in response to the war, which answered the question: Does a subject have the right to change allegiance when a former sovereign’s power to protect is irrevocably lost? In 1650, a pirated edition of The Elements of Law, Natural and Politic was published. It was divided into two small volumes (Human Nature, or the Fundamental Elements of Policie and De corpore politico, or the Elements of Law, Moral and Politick). In 1651, the translation of De Cive was published under the title Philosophicall Rudiments concerning Government and Society. Meanwhile, the printing of the greater work proceeded, and finally appeared in mid-1651, titled Leviathan, or the Matter, Forme, and Power of a Common Wealth, Ecclesiasticall and Civil. It had a famous title-page engraving depicting a crowned giant above the waist towering above hills overlooking a landscape, holding a sword and a crozier and made up of tiny human figures. In such a state, people fear death, and lack both the things necessary to commodious living, and the hope of being able to toil to obtain them. So, in order to avoid it, people accede to a social contract and establish a civil society. According to Hobbes, society is a population beneath a sovereign authority, to whom all individuals in that society cede some rights for the sake of protection. Any power exercised by this authority cannot be resisted, because the protector’s sovereign power derives from individuals’ surrendering their own sovereign power for protection. The individuals are thereby the authors of all decisions made by the sovereign. „he that complaineth of injury from his sovereign complaineth that whereof he himself is the author, and therefore ought not to accuse any man but himself, no nor himself of injury because to do injury to one’s self is impossible”. There is no doctrine of separation of powers in Hobbes’s discussion. According to Hobbes, the sovereign must control civil, military, judicial and ecclesiasticalpowers, even the words. In 1654 a small treatise, Of Liberty and Necessity, directed at Hobbes, was published by Bishop John Bramhall. Bramhall, a strong Arminian, had met and debated with Hobbes and afterwards wrote down his views and sent them privately to be answered in this form by Hobbes. Hobbes duly replied, but not for publication. However, a French acquaintance took a copy of the reply and published it with „an extravagantly laudatory epistle”. Bramhall countered in 1655, when he printed everything that had passed between them (under the title of A Defence of the True Liberty of Human Actions from Antecedent or Extrinsic Necessity). In 1656, Hobbes was ready with The Questions concerning Liberty, Necessity and Chance, in which he replied „with astonishing force” to the bishop. As perhaps the first clear exposition of the psychological doctrine of determinism, Hobbes’s own two pieces were important in the history of the free-will controversy. The bishop returned to the charge in 1658 with Castigations of Mr Hobbes’s Animadversions, and also included a bulky appendix entitled The Catching of Leviathan the Great Whale. Hobbes opposed the existing academic arrangements, and assailed the system of the original universities in Leviathan. He went on to publish De Corpore, which contained not only tendentious views on mathematics but also an erroneous proof of the squaring of the circle. This all led mathematicians to target him for polemics and sparked John Wallis to become one of his most persistent opponents. From 1655, the publishing date of De Corpore, Hobbes and Wallis went round after round trying to disprove each other’s positions. After years of debate, the spat over proving the squaring of the circle gained such notoriety that it has become one of the most infamous feuds in mathematical history. Hobbes has been accused of atheism, or (in the case of Bramhall) of teachings that could lead to atheism. This was an important accusation, and Hobbes himself wrote, in his answer to Bramhall’s The Catching of Leviathan, that „atheism, impiety, and the like are words of the greatest defamation possible”.Hobbes always defended himself from such accusations. In more recent times also, much has been made of his religious views by scholars such as Richard Tuck and J. G. A. Pocock, but there is still widespread disagreement about the exact significance of Hobbes’s unusual views on religion. As Martinich has pointed out, in Hobbes’s time the term „atheist” was often applied to people who believed in God but not in divine providence, or to people who believed in God but also maintained other beliefs that were inconsistent with such belief. He says that this „sort of discrepancy has led to many errors in determining who was an atheist in the early modern period„. In this extended early modern sense of atheism, Hobbes did take positions that strongly disagreed with church teachings of his time. For example, he argued repeatedly that there are no incorporeal substances, and that all things, including human thoughts, and even God, heaven, and hell are corporeal, matter in motion. He argued that „though Scripture acknowledge spirits, yet doth it nowhere say, that they are incorporeal, meaning thereby without dimensions and quantity”. (In this view, Hobbes claimed to be following Tertullian, whose views were not condemned in the First Council of Nicaea.) Like John Locke, he also stated that true revelation can never disagree with human reason and experience, although he also argued that people should accept revelation and its interpretations for the reason that they should accept the commands of their sovereign, in order to avoid war. In 1658, Hobbes published the final section of his philosophical system, completing the scheme he had planned more than 20 years before. De Homine consisted for the most part of an elaborate theory of vision. The remainder of the treatise dealt cursorily with some of the topics more fully treated in the Human Nature and the Leviathan. In addition to publishing some controversial writings on mathematics and physics, Hobbes also continued to produce philosophical works. From the time of the Restoration, he acquired a new prominence; „Hobbism” became a byword for all that respectable society ought to denounce. The young king, Hobbes’ former pupil, now Charles II, remembered Hobbes and called him to the court to grant him a pension of £100. The king was important in protecting Hobbes when, in 1666, the House of Commons introduced a bill against atheism and profaneness. That same year, on 17 October 1666, it was ordered that the committee to which the bill was referred „should be empowered to receive information touching such books as tend to atheism, blasphemy and profaneness… in particular… the book of Mr. Hobbes called the Leviathan„. Hobbes was terrified at the prospect of being labelled a heretic, and proceeded to burn some of his compromising papers. At the same time, he examined the actual state of the law of heresy. The results of his investigation were first announced in three short Dialogues added as an Appendix to his Latin translation of Leviathan, published in Amsterdam in 1668. In this appendix, Hobbes aimed to show that, since the High Court of Commission had been put down, there remained no court of heresy at all to which he was amenable, and that nothing could be heresy except opposing the Nicene Creed, which, he maintained, Leviathan did not do. The only consequence that came of the bill was that Hobbes could never thereafter publish anything in England on subjects relating to human conduct. The 1668 edition of his works was printed in Amsterdam because he could not obtain the censor’s licence for its publication in England. Other writings were not made public until after his death, including Behemoth: the History of the Causes of the Civil Wars of England and of the Counsels and Artifices by which they were carried on from the year 1640 to the year 1662. For some time, Hobbes was not even allowed to respond, whatever his enemies tried. Despite this, his reputation abroad was formidable, and noble or learned foreigners who came to England never forgot to pay their respects to the old philosopher. His final works were an autobiography in Latin verse in 1672, and a translation of four books of the Odyssey into „rugged” English rhymes that in 1673 led to a complete translation of both Iliad and Odyssey in 1675. In October 1679 Hobbes suffered a bladder disorder, and then a paralytic stroke, from which he died on 4 December 1679, aged 91. His last words were said to have been, „A great leap in the dark,” uttered in his final conscious moments. His body was interred in St John the Baptist’s Church, Ault Hucknall, in Derbyshire.